Nothing signals the arrival of spring quite like blue skies and fluffy white clouds. And more rain showers. I can never bring myself to complain about rain in California, after years of drought.. Simple questions can have wonderful ramifications. Note to self: be on the lookout for new (to me 😀) vases. Now that I am spread out over three places, I have reason to look for some more beautiful objects. Color is sure to #sparkjoy for me! Love that you can find interesting combinations anywhere. 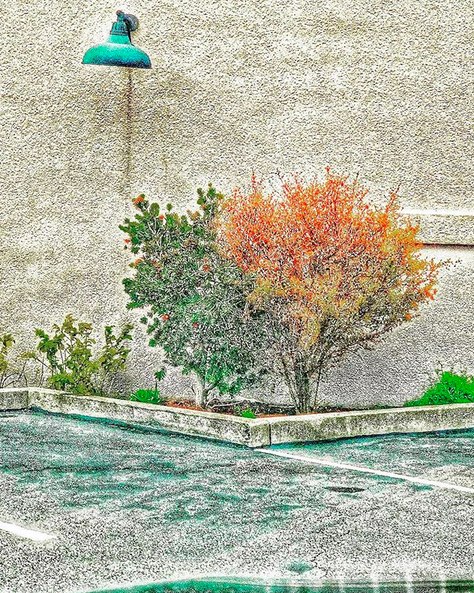 (In parking lots, sitting in my traveling office aka car 😂) Also helps to enhance colors through photo editing software! Cabin in the woods check in. I waste a lot of time being resentful of the damage the characters caused. At the same time, restoration + improvements are happening. Am almost at end of budget of paying for help. When weather a bit warmer I will start on my wall/ceiling treatment of this room (upstairs of barn). I figure it will take 40 hours of work (you know how those estimates go, unrealistic!). And a #KonMari(ed) kitchen is so much more pleasing to use! How wonderful to open a drawer and see just the tools I need, rather than a mountain of unloved/unused stuff. Sitting in car. More rain and more cookies and tea. I have had more cookies this past year than my entire life. It doesn’t even bother me too much. Warning 😀. Had a deadline, thank goodness, to get a portion of my paperwork finished for taxes. It was time to KonMari ALL my papers, again. Honestly, had been shuffling all my paperwork to a box since moving. Time passed. I am left with the three areas of papers: 1. Need to take action 2. Need for current year 3. Need to keep indefinitely. More to life than organizing. A lot more . . .
How could I almost forget about #Ribbonerie?! A visit every other year isn’t too harsh on the pocket book! Paulette Knight has been a one-woman show in San Francisco for 30 years. Seems to be a theme this year. I haven’t BEGUN to share how @stonemountainfabric #SparksJoy in my life. Now all I have to do is create and sew. I will post makes to the @jane_dolan Instagram account. But I always get a thrill at how organized these fabric and notions still life photos are. Time for my own KonMari Tidying Festival again. My stuff is driving me nuts. There’s too much of it. I won’t be able to put it away properly until I go through my categories, in order. As much as I would love to believe one only has to KonMari one’s house one time. That isn’t always the case, life circumstances change due to a move, travel, or whatever and things can go haywire. (Maybe that’s just me). Prepare and recharge for the new year. As you know, I love the KonMari Method of organizing, and was a very early adopter of it! I love using it with clients that more traditional organization methods haven’t historically worked for. Marie Kondo sparked a worldwide movement, and now we get to watch her work through her method with real people. The trailer just came out, and I can’t wait to binge watch the series when it releases on January 1st - perfect for an inspiring start to the new year. Be sure to watch the trailer above. And if it inspires you to start getting your house in order be sure to get in touch! Jane Dolan laying on the steps in front of a building in New York City. I took myself out on a date: movie and dinner. Wasn’t planning on dinner but the film was Japanese and there were noodles . . . I wish I could recommend “Never-ending man: Hayao Miyazaki” — what happens when the director and animator Miyazaki attempts to retire in his early 70’s. It’s a story worth telling, but the director of his story was lost. It’s easy to forget, and so important to remember when embarking on a tidying journey, just how much energy tidying takes! After an eight hour tidying session with a client, I am toast and in bed. Unfortunately an organized home still requires upkeep. Potatoes heating on a wooden chair with a lightbulb and metal tray attached. Organizing gives you space for amazing things! Alarm set for 5:30am tomorrow. Have a big drive for big job. This client and I have not tidied for almost six months. She told me she hasn’t done anything on her own, in my absence. I believe her. (This isn’t uncommon, and in no way makes you a failure!) And then of course life makes for a messy home! Sometimes you can’t complete the KonMari process before you move. Which is a bummer. You have to move hundreds of pounds of stuff you never ever will use, up how many flights of stairs? Ouch. But you know that’s how it goes. You can do only so much. But moving can also be an excellent opportunity to go through the KonMari process. It can be motivation to go through your miscellaneous items and get to make a choice. Cherish and keep. Or thank and release items to a new home. A place they will be cherished. Then your life is going to get a heck of a lot better. This season is always a mixture of work and holiday fun. Thank goodness I took this photo in Paris, which now seems like a lifetime ago. It also seems kind of funny now. I needed a part-time job to help me organize my time, and to be around creative people. I realized how much I talk out loud to myself and it’s creeping me out. Plus, it’s amazing how limits can help you organize. Mission Accomplished! I’m excited to start! Realistically, I can only do a few organizing jobs a week as it takes super power energy and focus. Learning a new job has been been a huge challenge (as if there are tiny challenges:-). But today I had fun. Milestone. Paper is my least favorite organizing category. Paper is my least favorite category. It’s one of reasons I have a post office box. I pick up my mail every couple of weeks. Sort it at the post office, and most of mail stays at the Post Office recycle bin. I stopped by to pick up my mail today and was surprised to find out it is a National Holiday, a National Day of Mourning. And so, the Post Office was closed. Where have I been? I had no clue such a Day existed.